Canada’s workforce challenges, it explains, are profound. But the reason we have not met them is simple: too much education for too many young people in too many areas that do not have a direct application to the needs of the job market. So, less education targeted to fewer students. Because those who wouldn’t qualify for this more elite system of higher education would probably have, you know, “limited skills”. Or at the very least be motivationally challenged. Right? Let’s take a closer look at what the label of “entitlement” might mean (we say “might” because we note that the CCCE report is intriguingly reference-free). Today’s “entitled” students pay $6,600 a year in tuition and other compulsory fees; by the time they graduate (2017-18), they will be paying $7,000 a year (all inflation adjusted). And that doesn’t include books, transportation, food or other living expenses. By way of comparison, for those CEOs who went to university in the early 1990s and who are now in their mid-40s, tuition and compulsory fees were $3,300 a year (1993-94, inflation adjusted). The average full-time market income for those “entitled” young people: $32,000 (Canadians 25 & under with a Bachelor’s degree in 2010: 2010 Survey of Labour and Income Dynamics). The lowest paid of Canada’s top 100 CEOs got $4.1 million last year, while the average salary was $9.2 million (representing an average pay raise of 16% over the previous year). Students who receive funding through the Canada Student Loans Program graduate with an average loan debt of $28,500, and the collective amount of student debt owed to the CSLP is estimated at over $16 billion. Remind us again who’s entitled here? Here’s an idea for consideration (and it even comes with references! ): Canada has the 9th lowest corporate tax rate of 189 countries, and the lowest of the G8. 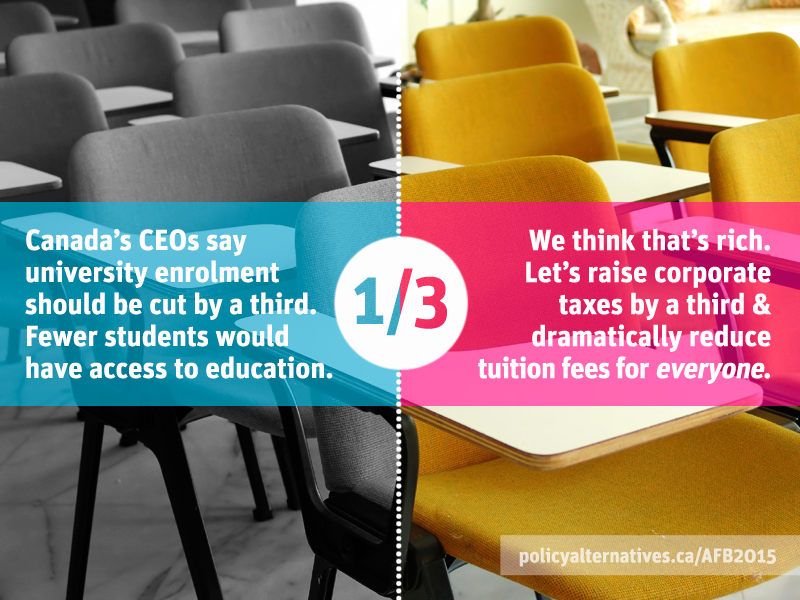 Rather than reducing university enrollment by 1/3rd, the Alternative Federal Budget recommends increasing Canada’s corporate tax rate by 1/3rd (from 15% to 22%). This would raise $6 billion a year (after the investment tax credit). What to do with all that newly-liberated money? The AFB recommends reducing tuition fees to 1992 levels (which would be what a number of CEOs paid when they went to university); this would cost $2 billion annually. Or, we could go further and eliminate tuition fees altogether at $3 billion a year. In other words, a little entitlement is okay–so long as it comes with a CEO seal of approval. This blog post was co-authored by Erika Shaker and David Macdonald. Erika Shaker is the Director of CCPA’s Education Project. You can follow Erika on Twitter @ErikaShaker. David Macdonald is a Senior Economist with the CCPA and coordinator of the Alternative Federal Budget. You can follow David on Twitter @DavidMacCdn. What would a 1/3 increase in corporate taxes do to investment (or divestment) in Canada? Obviously we would have to have some idea about the magnitude of that effect before we could ever contemplate taking such a move seriously. Right? Do we have relevant data? Good question Chris. Given that we’ve already got the lowest CIT rate in the G8, you wouldn’t actually get a better deal elsewhere. We’ve also structured the AFB’s CIT changes to include a credit for investment…so if corps are investing profits in Canada, they effectively pay a lower rate.